This winter has been one of the least snowy on record here. To make up for the lack of white fluffy stuff, I organized this fun DIY snow globe craft for my son. I HEART Crafty Things and CraftElf provided the inspiration. Before we got started crafting, we read Snowmen at Night, a wonderfully enchanting book about snowmen who frolic and party while humans slumber in their beds oblivious. I glued the cardstock onto the cardboard for added sturdiness. Then I laid the plate facedown onto the cardstock and traced around it lightly. Now I handed my son the jumbo marshmallow and some white paint I’d squirted onto a paper plate. 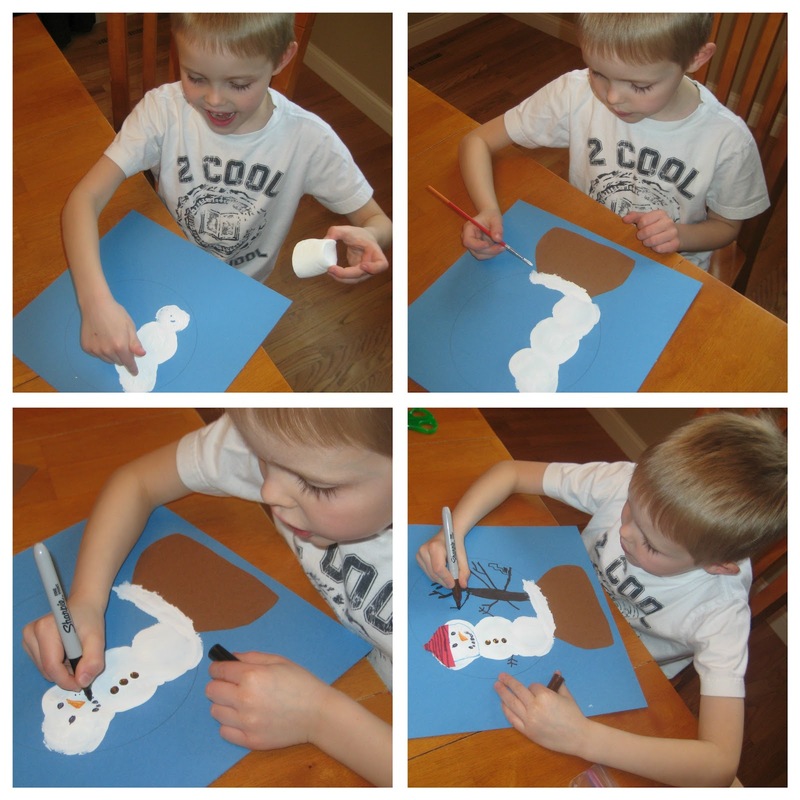 The marshmallow was the perfect shape to stamp a snowman body! Now it was time to give Frosty some personality. My son added a hat, eyes, nose, mouth, buttons, and stick arms. To finish the wintry scene, he drew a bare tree. 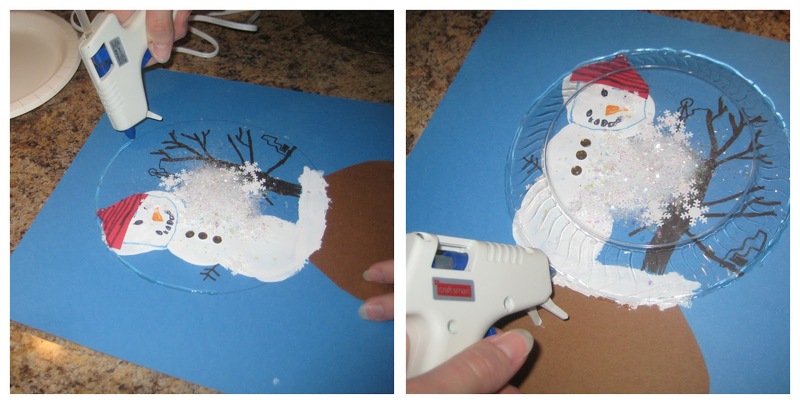 Up to this point, my son just couldn't see how it was going to be a snow globe. After all, it just looked like a mixed-medium piece of art. Here’s where the magic happens! I gave him a few shakers of iridescent glitter and some snowflake shaped confetti and told him to add it all in a pile in the middle of the circle. Once the pile was sufficient, I used the low-temp glue gun to add a bead of glue along the line I’d traced. He quickly added the upside down clear plate. We checked to see that there were no gaps between the glue and the plate and added more glue wherever necessary, making sure the seal was tight. 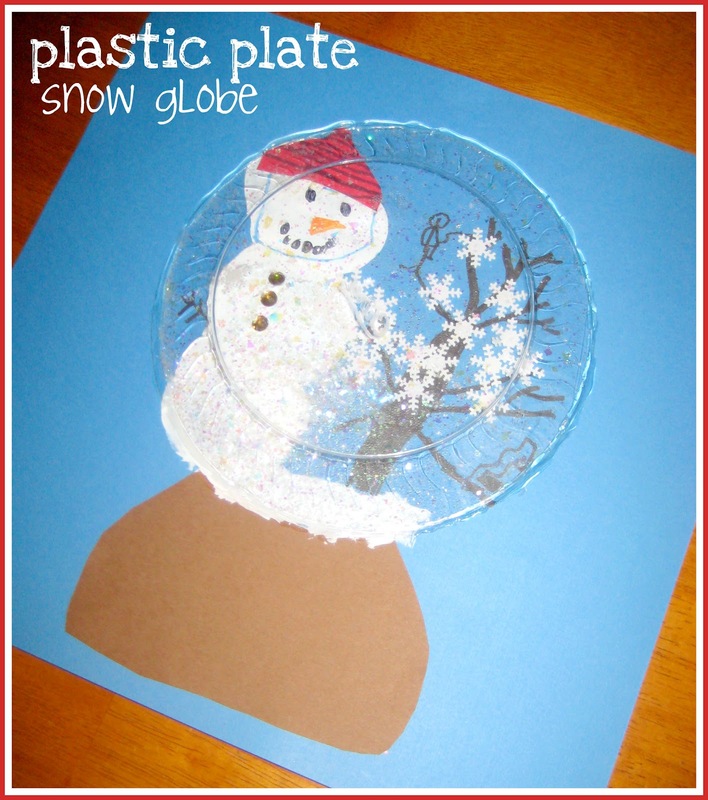 After a minute, our snow globe was done. My son gave it lots of shaking and had fun watching the glitter and snowflakes dance around his snowman. I just thought it was super cute, and then I found out you can actually shake it....Holy Smokes I am lovin it!!! Really cool idea! I LOVE this book! 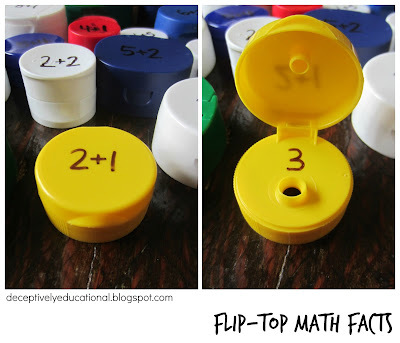 I'm going to try this activity! Thank you so much for linking this up to Read.Explore.Learn. It such a wonderful craft. What a great idea! Can't wait to try it. We love that book, too. That is just too cute, great craft idea to say goodbye to winter! Thanks so much for sharing on Craft Schooling Sunday! How fun!! We love that book as well. Thank you for sharing at Sharing Saturday!! Have a great week! oh this would be a hit with any kid!! Love this! Pinning it because we will be recreating it next year! What a great idea! My class will LOVE this! Wow! This is really fantastic! Thank you for sharing this creative art. Awesome and perfect for the kids. We also did a DIY Bird Feeder also out of recyclable plates. You should check this out!